Designed with high buoyancy for maximum security. A large flotation collar supports the user’s head for keeping the head out of water and its design provides the user’s return on time. The life jackets have a crotch strap for keeping the vest secure whilst in the water. It includes one webbing fastener, whistle, plastic zip and SOLAS retro reflective tapes. An end rope with plastic button is fixed at the end of each life jacket for adjustable wearing. It also provided with a lifting loop for rescue. 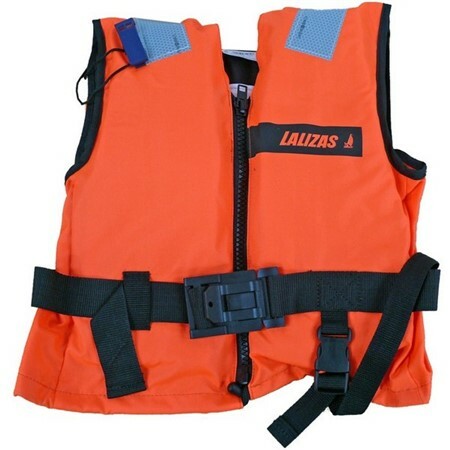 Approved to the latest European standards for 100N life jackets, ISO 12402-3. All of its raw materials are certified per ISO 12402-7 and ISO 12402 -8, for higher strength, quality and durability. It is available in 6 sizes, in fluorescent orange colour. Inexpensive life jacket with good freedom of movement through well thought out distribution of buoyancy foam. Flat collar for higher comfort, adjustable with tie-cords on neck and hem, integrated crotch strap, reflective bands for increased safety, signal whistle and zipper.